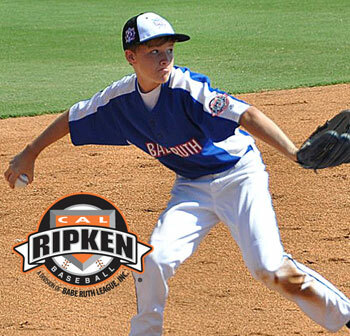 Major Division: The most experienced level of Cal Ripken Baseball, recommended for 11 and 12 year old players. Cal Ripken Baseball is played under the Official Baseball Rules, but implements some special rules as necessary for the development and welfare of this young age group. In order to encourage the league to train more pitchers, there are rules that set the maximum number of innings a pitcher may pitch in a calender week. Major/70: Featuring a 50' pitching distance and 70' base paths, this division is offered as an option to the major division format, and includes a tournament trail from District competition through the World Series in Aberdeen, Maryland at the Ripken Baseball Complex featuring 8 International Champions.